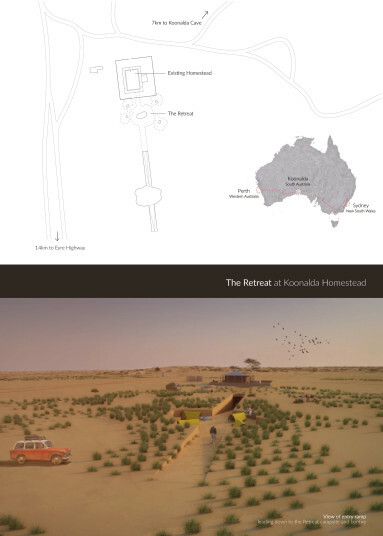 The Retreat is an underground extension of the Koonalda Homestead, a space that presents travellers the opportunity to disappear temporarily from the surface of the earth and revel in the peaceful isolation offered by the secluded location. The hotel sits beneath the Koonalda Homestead, a campsite that had once served as a stopover for food and fuel to travellers crossing the Nullarbor Plain via the old Eyre Highway. The Nullarbor Plain is a part of the area of flat, nearly treeless, arid country of South Australia. Crossing the Nullarbor is considered by many Australians to be a quintessential journey in order to experience the ‘Australian outback’. The journey begins from either the Western or Eastern end of the continent, involving long drives along endlessly straight roads surrounded by nothing but deserts and the occasional town. Plenty of rest areas doubling as free camping grounds can be found along the road, as well as paid accommodation for those unwilling to sleep in their car or in a tent. The Koonalda Homestead is 14 km north of the Eyre Highway. The road leading up to it is unsigned and notoriously easy to miss, inviting only the tenacious traveller to visit. The Homestead campsite is made up of an old petrol pump building, a house, as well as a sheep shed. Nearby sits a ‘car graveyard’ made up of an assortment of old cars that have been left behind in the plains, never to be driven again. The Retreat acknowledges the vast openness of the featureless Plain upon which it sits. 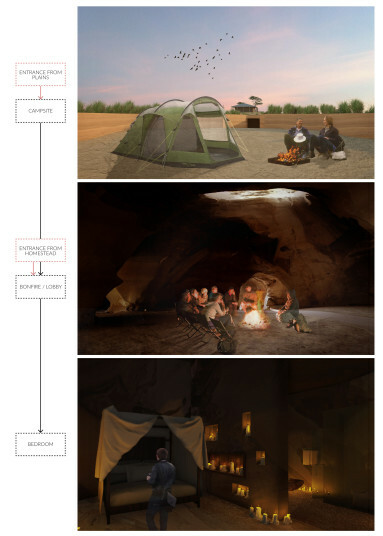 Its subterranean nature allows the desert landscape to remain flat and uninterrupted, and pays tribute to the karst landscape of the Plain riddled with natural caves and sinkholes. The Retreat can be accessed via a simple ramp south of the Homestead campsite or through a set of stairs found within the Homestead building itself. 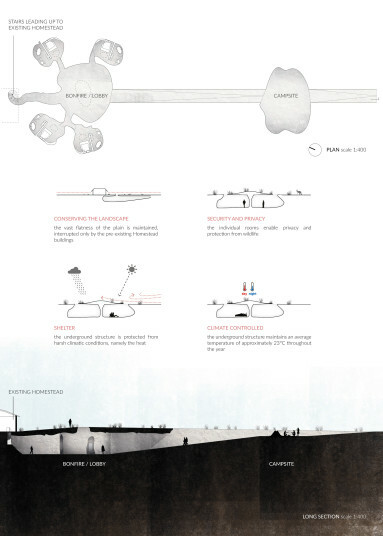 It features a small campsite set 1 m beneath ground, enough to shelter outdoor campers from winds. Another ramp then descends from the campsite down towards the Retreat proper, ending in a cave that branches off into individual bedrooms. At night, a bonfire greets visitors as they enter the Retreat. The relative luxury of the Retreat juxtaposes the camping experience offered by the Koonalda Homestead campsite. It derives its opulence from the relief of climbing into a soft, warm bed orstepping into a hot bath after days of sleeping in a cramped car and washing by the roadside. It allows visitors to indulge in the peace of the desert as they descend beneath the surface of the earth, safe from the harsh arid climate of the Nullarbor Plain. The next morning, the visitors reemerge from the embrace of the earth, well rested and ready to take on the rest of their journey.